Metropolis Mall at Hiland Park might be one of the oldest malls in Kolkata (and hence dated) but it has a whole bunch of stuff you can do. The mall has a bunch of shops selling handloom sarees and handcrafted products at amazing prices. Located on the ground floor is Bunkari India which has a splendid collection of handloom sarees, kurtas and home décor items. And they have a 60% sale going on. 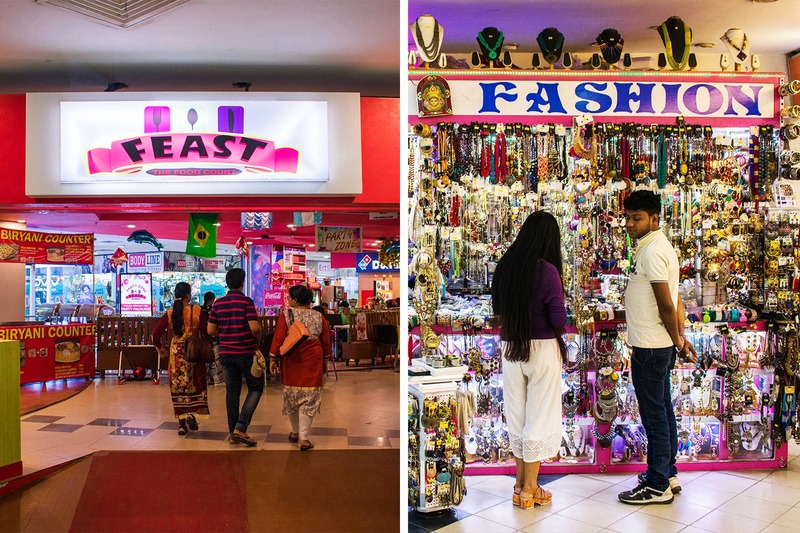 Head to the first floor and you will also find a Sreeniketan shop with a variety of silk and cotton sarees, men’s kurtas and pajamas, accessories and even kid’s clothes. Men, you can get made to order shirts and bottoms at The Raymond Shop. Stock up on some junk jewellery at Rajlaxmi Fashion starting from INR 5 only! It’s a kiosk which sells beautiful jhumkas, lockets and even oxidised stuff like rings, brooches, maangtikas and more. Chique Fashion ups the game with beautiful pearls, silver, and ‘fashion jewellery’. The mall has a very popular Damro outlet right beside it. From beds to recliners and shoe racks to bookshelves, you can give your home an upgrade at this shop. You can also get amazing sofa sets from Estillo which is located inside Metropolis Mall on the ground floor at amazingly low prices. You can also take a stroll through Big Bazaar and get great quality products for your daily lifestyle as it caters to every need of your family. In the mood for a quick bite? Order a Sub of the Days at Subway or a pizza at Dominos – their food court has a variety of restaurants. Or skip the kiosks and hit up Café Coffee Day for a caffeine kick. If you are looking for a proper meal, dig into amazing Thai and Chinese at the Hidden Dragon (pocket friendly with price for two starting from INR 650 only). Shahi has North Indian including aromatic kebabs. If you love Lebanese, head to The Arab Knights. The bar at the mall, Illusion, serves North Indian, Chinese and Continental and has an “All Day Happy Hour” scene going on from Sunday to Friday where the drinks and a few starters are all come for around INR 99- 149! Soak your feet and relax at the one and only Ziva Spa and Hammam and let all the tension melt away. Get amazing Thai massages and experience the atmosphere of a hammam. The second floor has Bodyline Sports where you can buy everything you need for your fitness needs. Get great deals at their monsoon sale – upto 50% off! They also offer services to repair fitness equipment, and set up gyms and fitness centres for homes and institutions, designing fitness centre layouts, branding, flooring, and providing supplemental services for running gyms. The mall is one of the few to have a tattoo parlour. Powerful Tattoos is a tiny space right outside Sreeniketan and rumour has it that Suman, the tattoo artist had etched a tattoo on one of his customers in only 6 hours! You can break your tattoo virginity here at only INR 700 sq/inch. If you are looking for something temporary then opt for Manoj Nail Art, quiet popular among the girls. They are one of the best nail/mehandi artists in the city and they also render out their services at weddings and other occasions. This mall has a Camarena store, one of the largest camera retail chains in India. A multi brand store, their products include compact digital cameras, DSLRs, lenses, tripods, camera bags, backpacks, filters, lens hoods and other camera accessories. Manfrotto, Hoya, Benro, Vanguard, National Geographic, Lowepro, Lenscoat and Ikelite are few of the accessories brands that you can pick up here. Then there is the SH Mumtazuddin shop from a chain that is one of the oldest entrepreneurs in the city. They deal in electronics, gadget, cellphones, and home accessories. You can pick up their branded GABA mobiles from this store.